TICKETS (AUS) (Bay 2006-Stud 2011). 4 wins-2 at 2, STC Phar Lap S., Gr.2. Sire of 151 rnrs, 76 wnrs, inc. Eastender, Difficult to Get, Gracious Ryder, Military Forces, Ransom Money, Happy Fiery Dragon, Ixcatan, Mr Conductor, Ticketing, Tickets on Her, Concessions, Hand it In, Just Truckin', Salesman, Backstage Pass, Elle a Walking, Radiant Girl, Space Time, Tickets to Ride, Totally Wicked, Itasca, Lucky Ticket, Mr Tickets, Royal Stamp, etc. Furious Jet (g. by Jet Spur). 8 wins to 1200m, A$133,652, 2d ATC Hollywood Fashion Secrets H., 3d ATC Bondi Pipe Freezing H., Australian Turf Club H.
Ticked Off (f. by Tickets). 2 wins. See below. Typical Woman (f. by Not a Single Doubt). 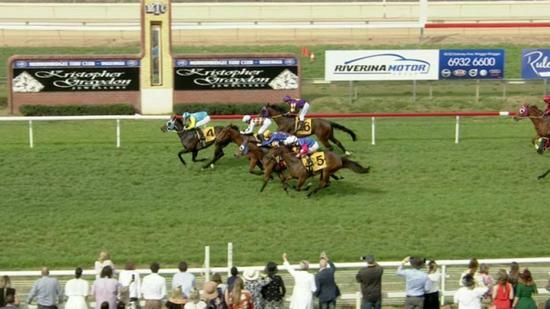 Winner at 1150m in Aust. Bindabooberri (g. by Dreamscape). Placed at 3 in 2017-18 in Aust. Approved Anger. 3 wins from 1200m to 1600m to 2016-17, MRC Cove Hotel P., 3d MVRC Penang Turf Club H.
Fuming. 3 wins-1 at 2-to 1400m, A$82,990, SAJC Marsh Insurance 2YO H., TTC Carlton Draught H., 2d ATC Turf Club H., TTC Cressy Chaff Cutters H., 3d Wyong Magic Millions 3YO S.
The Big Easy. 3 wins-1 at 2-from 1450m to 1850m, R275,657 in South Africa and Mauritius, 2d Turffontein Racing. It's a Rush Novice P., Vaal Book a Table Graduation P., Soccer GG Novice P., 3d Vaal Thank You for Joining Us Today H.
Absolutely Livid. 2 wins. See above. In a Huff. Winner at 2 in Aust. Livada. Winner at 900m in Aust. Fortunate Fury. Placed at 3, 2d BRC Sequalo at Lyndhurst Stud H., 3d BRC Carlton Mid P.
Livid (Luskin Star). 3 wins. See above. Brinney (Marscay). 6 wins-1 at 2-from 1200m to 2000m, A$178,640, Winfield Darwin Cup, AJC Gallipoli Welter H., Darwin Guineas, STC Kingsgrove Public P&C H., 2d BATC Courses for Horses H., QTC Noel H., 3d STC Gloaming S., Gr.2, AJC Breeders' P., Gr.3, BATC Tulloch H., 4th STC Carringbush Cup, Gr.2, AJC Dulcify Quality H., L.
Knight's Word. 6 wins from 1200m to 2000m, A$105,815, VRC Scalzo Food Industries Welter H., 1700m-in track record time, Star of the Realm H., Kiwi H., 2d VRC AFL Legends H., VATC Plush H., 4th Mornington Cup, L.
ARKADY (Myocard). 7 wins-2 at 2-from 1000m to 2000m, A$641,840, STC Ranvet S., Gr.1, Frank Underwood Cup, L, Queanbeyan Cup, STC Flotilla Welter H., GJC Moore 2YO H., AJC GT Rowe 2YO H., STC Balydoyle H., 2d STC Mercedes Classic, Gr.1, ACT RC Canberra Cup, L, AJC GP Nailon Flying Welter H., 3d AJC Maroubra 2YO H., 4th AJC George Main S., Gr.1, GCTC AD Hollindale Cup, Gr.2, VATC Sandown Classic, Gr.2, VRC Saab H., Gr.2. OLONANA (More Than Ready). 3 wins-1 at 2-at 1000m, 1100m, A$181,800, AJC Challenge S., Gr.2, MRC Biscay H., STC Tacking Point Tavern 2YO H., 4th VRC Cadbury Roses S., L. Producer. SUPER SAVINGS (Secret Savings). 4 wins-1 at 2-to 1300m, A$128,095, AJC Breeders' P., L, MVRC Pulse Pharmacy H., 2d VRC Rashlore H., 3d Wyong RC Strawberry Hill Slipper S., MRC Blazing Saddles H., MVRC Cathay Pacific H.
PARIS PETARD (Mujahid). 7 wins-6 at 2-to 1400m, A$338,075, WATC Sires' Produce S., Gr.3, Belgravia S., L, Gimcrack S., L, Paklani P., Tibradden 2YO H., Tudor Mak 2YO H., Stainless Steel Range 2YO H., 3d WATC Karrakatta P., Gr.2. Producer. 2 wins at 900m, 1000m to 2017-18 in Aust.